Home FAQ Affiliates Contact BUY NOW! EXACTLY what you're doing on Your Computer? ... with the one privacy tool you'll NEVER regret discovering! You’re checking out the sport scores online … looking for holiday deals … browsing your favorite websites … all when you’re supposed to be doing something else. SUDDENLY, you become aware of a presence behind you! Is it the BOSS? Is it the WIFE? Is it that dork Adrian from Accounts who would just LOVE to see you get into trouble? At the very least, it’s embarrassing. At worst, it could cost you your relationship (especially if you are looking at sites you KNOW your partner wouldn’t approve of) … or even your JOB. Dow Chemical recently fired 24 employees and disciplined 200 others for using the Internet for personal use during work hours. Xerox have just dismissed 40 US workers for violating its Internet policy. UK IT manager Lois Franxhi recently lost her claim for unfair dismissal after being sacked for using the Internet for finding a holiday during office time. 23 workers have just been fired from the New York Times' accounting department in Virginia, for looking at material deemed "inappropriate and offensive". In fact, the magazine Personnel Today discovered that, out of 544 firms they interviewed; over a quarter had FIRED people for using the Internet for reasons not related to work. Even more alarming is that most of these incidents were reported by co-workers! More embarrassingly, how would you explain it to your family? Or EVEN WORSE... what if it was your FAMILY that actually CAUGHT YOU? ... And NEVER Get Caught Out Again! There's a great piece of software you're going to love! It's called Hide IE and it could save you your job, your relationship, or even your marriage! At the very least it's going to save you a few minutes of EXCRUCIATING EMBARRASSMENT which I'm sure you could do without! Evidence-Blaster, File-Saver, Undelete NOW!, Messenger-Patch, and many others. We're extremely popular with our clients and slightly less than popular with our clients' employers. But do you know what? WE DON'T CARE. We think what you do on your computer is your business and yours alone . Hide IE is the simplest and most effective tool you can use to INSTANTLY guarantee your privacy. We've never been as excited about a product as this... and that's because Hide IE ROCKS. You install Hide IE. It's a snap. From now on, whenever you turn on your computer, Hide IE starts but remains HIDDEN. No-one apart from you will even know it's there! When you hear footsteps behind you, HIT your secret keystroke - such as the Windows key and X. In a fraction of a second, your open browser windows disappear and your sound is muted INSTANTLY! Any pop-up windows are suppressed automatically. You PRETEND to be busy! Your boss, co-workers or partner will admire your strong work ethic and powers of concentration. You hit your hotkey AGAIN and all your open windows reappear EXACTLY as you left them! You can carry on as you were... before you were so RUDELY interrupted! It's THAT simple! And you can have Hide IE up and running on your computer in just five minutes... Automatically protecting YOU, your JOB and your RELATIONSHIP. Just INSTALL it and FORGET about it. It loads when you turn on your computer and stays running, HIDDEN AND UNDETECTABLE until you press your secret hotkey. With Hide IE They’ll NEVER Know! - Playing Games at Work? That wouldn't look very good would it? Don't panic! With Hide IE installed, a simple keystroke lets you hide all your gaming sessions INSTANTLY. Just fire up that ever-so-boring Excel spreadsheet until your unwanted visitor goes away... and then go straight back to zapping aliens, playing Solitaire, or whatever else tickles your fancy! - Checking out your favorite sites... when you should be working? Come on, we all do it! But that's not going to do you any favors when your boss finds out. The answer is simple! All you need to do is have Hide IE running in the background. Carry on checking out the soccer scores, reading your favorite blogs or searching for a holiday. When the boss turns up, all he sees is you -- hard at work! - Browsing ADULT sites? So what? It's only a problem when you GET CAUGHT! Imagine the embarrassment - try talking your way out of that one! With Hide IE you need never worry again! Always on its guard, Hide IE will hide all open browser windows, webcam viewers, chat sessions at the touch of a button - and mute those telling sounds too! Your partner or boss will never know what you get up to online. - Applying for a new job? Fed up with the Internet usage policy at your current job? I don't blame you. Still, it wouldn't be a good idea to let them know that you're looking elsewhere just yet now, would it? Hit your Hide IE hotkey and all the job sites and recruitment e-mail messages disappear - as if by magic! Hide IE Works the Way YOU Want It To! If Hide IE magically closed your browser windows and saved you from embarrassment, all by pressing a magical hotkey, surely it'd be an absolutely MUST-HAVE tool, right? But Hide IE does SO MUCH MORE BESIDES. You see, Hide IE is completely customizable. DON'T want to hide all browser windows, just the ones which you KNOW are going to get you into trouble? Fine. Just let Hide IE know which web addresses you want to hide and when you hit the hotkey they'll disappear, leaving all those dull, corporate, work -related web sites right there on the screen! PERHAPS you just want to hide your chat sessions? Or maybe you just want to hide chat sessions with certain people? ALTERNATIVELY, you might want to hide Windows Media Player, those three 'adult' sites you look at occasionally AND all e-mail messages? With Hide IE you can hide ANY combination of browser windows and other applications. And it's EASY. Just a couple of clicks with the mouse is all it takes to get Hide IE working EXACTLY as you want it to! Hide IE carries on working in the background day and night... completely undetectable... waiting for you to hit the hotkey and... WHAM! All your potentially incriminating windows just DISAPPEAR! You'll NEVER Want to Be Without It! HIDES your private browser windows -- to PROTECT your marriage! No need to worry about browsing adult Web sites anymore. Just one keystroke is all it takes to automatically hide all of your Internet Explorer browser windows. You can even set Hide IE to hide just CERTAIN Web site addresses, and not others! And it doesn't stop there -- Hide IE can also work with FireFox, Netscape and ANY other browser. SECRETLY hide chat windows, MSN messages and more! You can configure Hide IE to automatically hide any other window you desire. Customize it to hide all Windows with certain text in the title bar, or customize it to hide all programs of a particular "type." Make it hide all AOL instant messages from a particular person... or hide a particular Java chatroom applet... or hide and mute Windows Media Player. It doesn't matter -- with Hide IE, you have FULL CONTROL. You can make ANYTHING DISAPPEAR, instantly! SPECIAL configuration options to make YOU look innocent! Imagine the individual that disturbed you now wants to begin USING your PC! Not a problem... Hide IE will continue hiding your private windows until you press your secret keystroke again. All NEW browser windows will appear as NORMAL... while your hidden ones remain hidden! You can also set Hide IE to automatically hide NEW private windows, such as chatroom messages and popups. Hide IE does EVERYTHING POSSIBLE to protect your privacy. TOTAL stealth mode means TOTAL protection! Hide IE runs in "stealth" mode, which means no-one will know it's running on your PC -- not even "experts!" In fact, to access the settings screen, you need to press a special key combination, then enter your unique encrypted password. That's security! Plus, Hide IE automatically starts with Windows, so there's NEVER any need to "think" about running the program again! Discreetly mutes the sound -- STOP prying ears! You can set Hide IE to automatically mute the sound on your computer, to stop movies or noisy Web pages from giving you away. It even lowers just the "Wave" control on your PC, so the "Master Volume" still looks as though it's fully operational. THAT'S the sort of clever thinking you'll find with Hide IE! When you need to protect your privacy, you DON'T want to spend time thinking about your special key combination. Hide IE allows you to completely customize every secret hotkey used in the program! 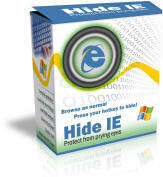 You can install and uninstall Hide IE at any time. This exciting tool even allows you to remove its most intimate settings from the registry by clicking a single button. It's THAT easy to enjoy total privacy, within seconds, using Hide IE. What Is YOUR Privacy WORTH to YOU.... ? ... your REPUTATION... your RELATIONSHIP or MARRIAGE... ? Are those things worth a measly $49.95 dollars to you? Certainly mine are worth much, MUCH more to me! But we don't want you to pay $49.95 for YOUR copy of Hide IE. To celebrate our recent launch, we're currently offering Hide IE at LESS THAN HALF PRICE -- just $19.95 when you buy TODAY! How about that? Unbeatable protection against losing your job, your reputation and your relationship ... for LESS than the price of a KFC bucket meal! But that's not all. If you order before midnight TONIGHT, we're going to give you a chance to purchase three of our other products at an AMAZING DISCOUNT. Use them in combination with Hide IE for UNBEATABLE protection against privacy invasion! Ever wondered what you're accepting with those lengthy End User License Agreements? Stop wondering - start checking! EULAyzer automatically checks lengthy EULAs for suspicious content, and warns you INSTANTLY. You'll receive the 100% FULLY-WORKING version of EULAyzer for FREE with your purchase! Evidence-Blaster is the world's most popular privacy tool. It enables you to instantly zap all of your Web browsing history so NOBODY knows what you've been up to. It's the perfect companion to Hide IE. We'll send you a trial version and a huge $5 discount voucher. Your hard drive stores more secrets than you'd think! All of your deleted files can be recovered in an instant - thanks to a simple $15 program, such as File-Saver. To keep your privacy, you need a 100% BULLET-PROOF Government-level deletion tool. And that tool is Secure-Delete. With our $5 discount voucher, it'll cost you just pennies! Hate popups? Stop them instantly, with Messenger-Patch. We'll tell you exactly how you can stop Web browser and Windows Messenger popups on your system - with our 100% FREE Messenger-Patch $5 discount voucher. We're bundling a massive FIVE fully-functional bonus tools together to form our last offer. We'll send you an EXCITING collection of expensive Windows utilities to ensure your PC performs at its absolute best, EVERY day! You'll receive FULL VERSIONS of IE Blaster, Net Booster, RAM Booster, Voice Mail Compressor, and Download Manager. We promise you will NOT be disappointed with this amazing software collection! So, for just $19.95, you can get your own personal copy of Hide IE, the world's leading privacy tool which will make sure you NEVER get caught red-handed again! We'll also give you these FIVE BONUS GIFTS as a special thanks for your custom - collectively worth MUCH more than the cost of Hide IE itself! But you need to act FAST! We don't want EVERYONE to have Hide IE, even though we can imagine everyone wanting it. WHY? Because the fewer copies there are in circulation, the less chance there is that someone might suspect you of running it! So, although it seems like we're sabotaging ourselves, we're absolutely committed to honoring our strict software licensing agreement for this software. That means we can ONLY sell 450 exclusive copies of this version of Hide IE. And because we've got so few to sell, we can only hold the $19.95 price tag until MIDNIGHT TONIGHT! We have LESS THAN A THIRD of our licenses remaining. We'll still honor the 'early bird' price tag, but we are serious about only allowing 450 copies of Hide IE out in the marketplace. ROCK-BOTTOM PRICE, you must ORDER NOW!!! You've seen how Hide IE is the ultimate privacy tool. Easy to use and configure, active 24/7 and just waiting to protect you from embarrassment or worse... ALL at the touch of a button. You've read some testimonials from last month's mailbag... and seen how a $19.95 tool has given so many people peace of mind and protected aspects of their life that are priceless to them. You know that there are only a limited number of licenses available... and that we'll soon be selling the remaining few at the REGULAR price of $49.95. TRY Hide IE RISK-FREE for 30 DAYS! That's right. We're so convinced that you'll never want to be WITHOUT Hide IE once you've tried it, we're willing to let you try it out RISK-FREE for a whole 30 DAYS. PLUS, we'll lock your license in at the RIDICULOUSLY low price of just $19.95 (soon to revert to $49.95). AND, you can even KEEP the bonus items FREE of charge, if you decide you don't want Hide IE. But you MUST take action NOW! If Hide IE doesn't give you PEACE of mind, or SAVE your marriage, relationship or job at least ONCE during that time, just remove it from your PC with the handy 'uninstall' feature and you'll owe us NOTHING. That's a BIG PROMISE for a $19.95 investment, wouldn't you agree? Of course, whether you take advantage of this opportunity is entirely up to you. But, before I go, can I just ask you to consider just two things? How much LONGER do you think you're going to GET AWAY WITH IT, without being found out? What could be the CONSEQUENCES if you WERE caught? With a tiny investment in Hide IE, you can relax - it ain't gonna happen! P.S. Remember, this is your ONLY CHANCE to get Hide IE plus FIVE FREE GIFTS at a FRACTION of the regular price - just $19.95! We can ONLY guarantee this offer through till midnight Monday, so if you want premium protection at a bargain basement price, you'd better CLICK HERE! P.P.S. We only have a small stock of remaining licenses left. Once they're gone, we can't sell any more from this web site. That's because we want to make sure that Hide IE remains a powerful and effective tool for the protection of your privacy for many years to come. Please, please, don't delay. If you want all the benefits of Hide IE, you MUST ACT STRAIGHT AWAY! P.P.S. Hide IE is EXCLUSIVELY available via this site! It's NOT available in stores and you can ONLY purchase online at HideIE.com. Plus with its current discount, FREE gifts and limited stock remaining, there's never been a BETTER TIME to take advantage. Click to order TODAY!